Walk from NS Station Den Bosch Centraal. We walked from the station past the Jeroen Bosch hospital to Camp Vught. walked and took the bus (239) back to Den Bosch. Walk from Den Bosch about 19 km. This walk starts at the Central Station in Den Bosch. You walk out of the station towards the Court. Immediately after you leave the station you will see Café Mazzeltoff on your right. For the real Bossche bulbs you do not have to move into the store of bakery de Groot. These world-famous calorie bombs are also sold at Mazzeltoff. You walk past the Koning Willem I college and the AVANS Hogeschool to the Willemspoort transfer. You reach the Drongelense path that you continue to follow along the water for some time until you reach a bridge that leads you to the National Monument Camp Vught. 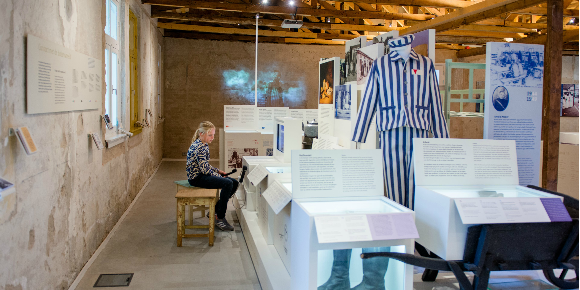 You can visit the former concentration camp Vught. You pass the famous residence Lunetten where from 1951 the KNIL soldiers were housed. Along the Genie museum and the Van Bredero barracks you reach the recreational area De IJzeren Man. Here you can enjoy a nice lunch in the beach pavilion of the same name before you continue your trip around the lake. After De IJzeren Man you walk through the Achterste Distelberg towards the nature reserve and the spur of the National Park Loonse en Drunense Duinen. Here you will find the restaurant De rustende Jager at Zandkantse Leij. This is a restaurant where walkers, but especially cyclists, also take a snack before continuing the journey. The last part of the walk goes over the Gommelsestraat towards the end of our walk towards Biezenmortel. 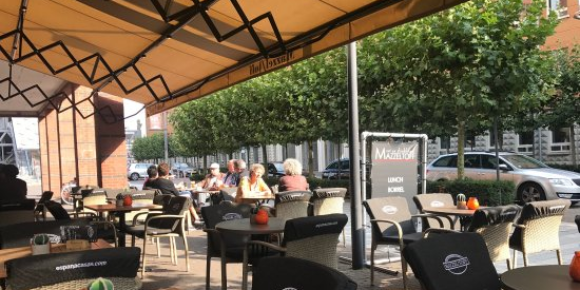 Here you will find a bus stop in front of the Café 't Gommelen that takes you back to' s-Hertogenbosch. In bad weather it is ideal to wait for the bus in the cafe while enjoying a drink. Using this GPS route is for your own account and risk. The route has been compiled with care and has been checked by a RouteXpert accredited by MyRoute-app. Due to changed circumstances, road diversions or seasonal closures, there may be changes. We therefore advise you to check each route before use. More explanations about the use of MyRoute-app can be found on the website at 'Community' or 'Webinars'.